Alma Ruth Burkhart married James Oscar Lassiter. Alma Ruth Burkhart was born on 2 February 1924. She was the daughter of John L. Burkheart and Sally Ella Voncannon. Alma Ruth Burkhart died in January 2007 at age 82. James Oscar Lassiter married Alma Ruth Burkhart, daughter of John L. Burkheart and Sally Ella Voncannon. Name Variation Evonne M. Tuttle was also known as Bartos. Evonne M. Tuttle was born on 22 March 1965. She died on 26 September 2002 at killed during bank robbery, Norfolk, Nebraska, at age 37 When the three gunmen burst into the bank shortly after it opened Thursday, they began firing within seconds, police said. The first person killed was Evonne Tuttle, 37, a single mother of three had stopped there on her way to visit her oldest daughter at college in Lincoln. Survivors include three daughters, Christine, 18, a student at Nebraska Wesleyan University in Lincoln, Virginia, 5, and Sarah, 3, both at home; her mother of Ewing; her birth father, Stanley Bartos of Stevensville, Mont; and two sisters, Rozan Smith of Creighton and Angela Charf of Omaha. She was preceded in death by her father and grandparents. Dean Tuttle died in October 1990. Earl Wright was born on 12 August 1914. He married Fern Arley Butterfield, daughter of Elmer Butterfield and Alice M. (? ), on 4 May 1939 at Yankton, South Dakota. Earl Wright died on 2 October 1985 at age 71. Married Name 2 November 1936 As of 2 November 1936,her married name was Gaughenbaugh. Married Name 4 May 1939 As of 4 May 1939,her married name was Wright. Fern Arley Butterfield was born circa 1918 at Nebraska. She was the daughter of Elmer Butterfield and Alice M. (?). Fern Arley Butterfield married Woodrow Gaughenbaugh on 2 November 1936 at Fall River, South Dakota. Fern Arley Butterfield married Earl Wright on 4 May 1939 at Yankton, South Dakota. [S243] U.S. Federal Census 1920 U.S. Federal Census, by Ancestry.com, Year: 1920;Census Place: Walnut Grove, Knox, Nebraska; Roll T625_994; Page: 5A; Enumeration District: 133; Image: 528. [S250] U.S. Federal Census 1930 U.S. Federal Census, by Ancestry.com, ar: 1930; Census Place: Walnut Grove, Knox, Nebraska; Roll 1284; Page: 5A; Enumeration District: 37; Image: 1190.0. David Allen Wright was born on 8 November 1939. He was the son of Earl Wright and Fern Arley Butterfield. David Allen Wright died on 5 July 2007 at age 67. U S Marine Corps, 1957 to 1959. Woodrow Gaughenbaugh was born circa 1915. He married Fern Arley Butterfield, daughter of Elmer Butterfield and Alice M. (? ), on 2 November 1936 at Fall River, South Dakota. Elmer Butterfield was born in May 1890 at Nebraska. He married Alice M. (?) before 1911. Married Name before 1911 As of before 1911,her married name was Butterfield. Alice M. (?) was born circa 1889 at Iowa. She married Elmer Butterfield before 1911. Name Variation Elmer Irvin Butterfield was also known as Irvin. Elmer Irvin Butterfield was born circa 1911 at Nebraska. He was the son of Elmer Butterfield and Alice M. (?). Name Variation Myrtle Opal Butterfield was also known as Opal. Myrtle Opal Butterfield was born circa 1913 at Nebraska. Name Variation Charles Justin Butterfield was also known as Justin. Charles Justin Butterfield was born circa 1915 at Nebraska. Garnet A. Butterfield was born circa 1916 at Nebraska. Name Variation Bertha Wilhelmine Friedrike Frohreich was also known as Bertie. Name Variation Bertha Wilhelmine Friedrike Frohreich was also known as Florich. Married Name 25 May 1874 As of 25 May 1874,her married name was Hermann. Married Name 25 May 1874 As of 25 May 1874,her married name was Herman. Bertha Wilhelmine Friedrike Frohreich was born on 22 September 1849 at the oldest child, Dorphagen, Pomerania, Prussia, also reported as 22 Sep 1850; also reported as Dievenow. She was the daughter of Wilhelm Friedrich Frohreich and Wilhelmina Louise Catharina Weinreich. Bertha Wilhelmine Friedrike Frohreich was baptized on 23 September 1849 at Dorphagen, Pomerania, Germany. Bertha Wilhelmine Friedrike Frohreich witnessed the baptism of Georgina Maria Hermann on 12 September 1875 at Zion Lutheran Church, Chippewa Falls, Chippewa, Wisconsin. Bertha Wilhelmine Friedrike Frohreich witnessed the baptism of Elisabeth Georgine Hermann on 3 December 1876 at Zion Lutheran Church, Chippewa Falls, Chippewa, Wisconsin. Bertha Wilhelmine Friedrike Frohreich witnessed the baptism of George Gottlob Hermann Jr. on 8 June 1878 at Zion Lutheran Church, Chippewa Falls, Chippewa, Wisconsin. Bertha Wilhelmine Friedrike Frohreich died on 11 June 1930 at Richmond, Henrico, Virginia, at age 80. She was buried after 11 June 1930 at Oakwood Cemetery, Richmond, Virginia. She had 9 with 9 living in 1900 children. Children of Bertha Wilhelmine Friedrike Frohreich and George Gottlob Hermann Sr.
[S5] Wisconsin, Wisconsin Marriages, 1835-1900, Volume: 01 Page: 0550. 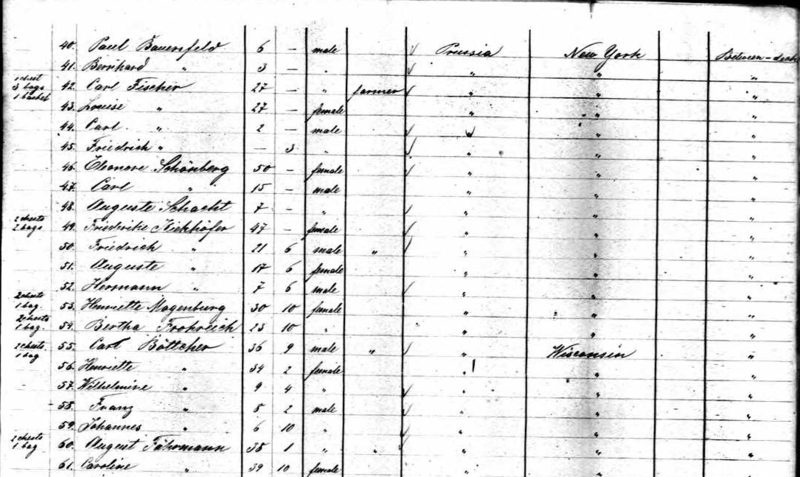 [S246] U.S. Federal Census 1880 U.S. Federal Census, by Ancestry.com, Family History Library Film 1254115 Page Number 509C. 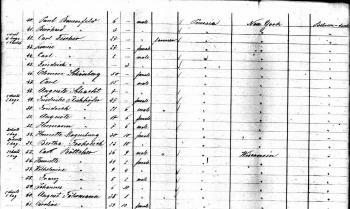 [S246] U.S. Federal Census 1880 U.S. Federal Census, by Ancestry.com, Year: 1900; Census Place: Fairfield, Henrico, Virginia; Roll T623_1713; Page: 30B; Enumeration District: 30. [S244] U.S. Federal Census 1910 U.S. Federal Census, by Ancestry.com, Year: 1910; Census Place: Fairfield, Henrico, Virginia; Roll T624_1631; Page: 6B; Enumeration District: 32; Image: 1059. [S243] U.S. Federal Census 1920 U.S. Federal Census, by Ancestry.com, Year: 1920;Census Place: Fairfield, Henrico, Virginia; Roll T625_1891; Page: 1A; Enumeration District: 43; Image: 991. Name Variation George Gottlob Hermann Sr. was also known as Herman. Name Variation George Gottlob Hermann Sr. was also known as Gottlob. Name Variation George Gottlob Hermann Sr. was also known as Georg. George Gottlob Hermann Sr. was born on 16 January 1846 at Waiblingen, Baden-Wurttemburg, Germany, also reported as Jan 1847. George Gottlob Hermann Sr. witnessed the baptism of Georgina Maria Hermann on 12 September 1875 at Zion Lutheran Church, Chippewa Falls, Chippewa, Wisconsin. George Gottlob Hermann Sr. witnessed the baptism of Elisabeth Georgine Hermann on 3 December 1876 at Zion Lutheran Church, Chippewa Falls, Chippewa, Wisconsin. George Gottlob Hermann Sr. witnessed the baptism of George Gottlob Hermann Jr. on 8 June 1878 at Zion Lutheran Church, Chippewa Falls, Chippewa, Wisconsin. George Gottlob Hermann Sr. died on 2 January 1929 at age 82. He was buried after 2 January 1929 at Oakwood Cemetery, Richmond, Virginia. George Gottlob Hermann Sr. immigrated in 1869. Name Variation George Gottlob Hermann Jr. was also known as Georg. George Gottlob Hermann Jr. was born on 26 November 1877 at Wisconsin also reported as 26 Nov 1878. He was the son of George Gottlob Hermann Sr. and Bertha Wilhelmine Friedrike Frohreich. George Gottlob Hermann Jr. was baptized on 8 June 1878 at Zion Lutheran Church, Chippewa Falls, Chippewa, Wisconsin. He married Ida Francis Isbell, daughter of William Henry Isbell and Annie E. Bullock, on 28 November 1906 at Richmond, Henrico, Virginia. George Gottlob Hermann Jr. married Goldie Pearl Martin, daughter of Charles H. Martin and Hannah Putze, on 12 September 1921 at Richmond, Henrico, Virginia. George Gottlob Hermann Jr. died on 5 September 1963 at Richmond, Virginia, at age 85. He was buried after 5 September 1963 at Oakwood Cemetery, Richmond, Virginia. George Gottlob Hermann Jr. was a farmer in 1918. On 12 September 1918 at World War I Draft Registration, Henrico, Virginia. In 1942 at U.S. World War II Draft Registration Residence: Henrico, Virginia. [S250] U.S. Federal Census 1930 U.S. Federal Census, by Ancestry.com, Year: 1930; Census Place: Fairfield, Henrico, Virginia; Roll 2447; Page: 22A; Enumeration District: 5; Image: 222.0. [S373] U.S. Federal Census 1940 U.S. Federal Census, by Ancestry.com, Year: 1940; Census Place: Fairfield, Henrico, Virginia; Roll: T627_4269; Page: 4A; Enumeration District: 44-16. Married Name Her married name was Erdt. Name Variation Anna Hermann was also known as Rosa. Name Variation Anna Hermann was also known as Anna. Name Variation Anna Hermann was also known as Annie. Anna Hermann married Ernest Erdt. Anna Hermann was born on 19 November 1884 at South Dakota also reported as Aug 1884. She was the daughter of George Gottlob Hermann Sr. and Bertha Wilhelmine Friedrike Frohreich. Anna Hermann died on 12 August 1934 at Richmond, Virginia, at age 49. She was buried on 14 August 1934 at Oakwood Cemetery, Richmond, Virginia. Married Name Her married name was Doggett. Ida Hermann married William Overton Doggett Jr.
Ida Hermann was born on 22 September 1891 at Henrico, Virginia, also reported as Sep 1886 South Dakota. Ida Hermann died on 9 June 1954 at Richmond, Virginia, at age 62. She was buried after 9 June 1954 at Riverview Cemetery, Richmond, Virginia. Conrad Ernest Hermann was born on 1 February 1888 at Virginia also reported as Feb 1889. Conrad Ernest Hermann married Clara (?) circa 1930. Conrad Ernest Hermann died on 11 December 1946 at age 58. He was buried after 11 December 1946 at Bethlehem Baptist Church Cemetery, Richmond, Henrico, Virginia. Conrad Ernest Hermann was a farmer in 1917. On 5 June 1917 at World War I Draft Registration, Henrico, Virginia. In 1942 at U.S. World War II Draft Registration, Henrico, Virginia. [S243] U.S. Federal Census 1920 U.S. Federal Census, by Ancestry.com, Year: 1920;Census Place: Brookland, Henrico, Virginia; Roll T625_1891; Page: 8B; Enumeration District: 40; Image: 866. [S250] U.S. Federal Census 1930 U.S. Federal Census, by Ancestry.com, Year: 1930; Census Place: Brookland, Henrico, Virginia; Roll 2447; Page: 11A; Enumeration District: 4; Image: 160.0. [S373] U.S. Federal Census 1940 U.S. Federal Census, by Ancestry.com, Year: 1940; Census Place: Brookland, Henrico, Virginia; Roll: T627_4269; Page: 19B; Enumeration District: 44-2. Name Variation Fritz Hermann was also known as Fred. Fritz Hermann was born on 17 September 1889 at Virginia also reported as Sep 1891. Fritz Hermann died on 27 July 1928 at age 38. Fritz Hermann was a farmer in 1917. On 5 June 1917 at World War I Draft Registration, Henrico, Virginia, reported supporting sister and her children (under age 12). [S243] U.S. Federal Census 1920 U.S. Federal Census, by Ancestry.com, Year: 1920;Census Place: Fairfield, Henrico, Virginia; Roll T625_1891; Page: 18B; Enumeration District: 42; Image: 984. Name Variation Georgina Maria Hermann was also known as Georgia Mary. Name Variation Georgina Maria Hermann was also known as Mary A. Married Name 20 June 1906 As of 20 June 1906,her married name was London. Georgina Maria Hermann was born on 2 June 1875 at Wisconsin also reported as 2 Jun 1877. Georgina Maria Hermann was baptized on 12 September 1875 at Zion Lutheran Church, Chippewa Falls, Chippewa, Wisconsin. She married Louis L. London, son of A. B. London and Fannie (? ), on 20 June 1906 at Richmond, Virginia. Georgina Maria Hermann died on 14 December 1964 at Richmond, Virginia, at age 89. She was buried after 14 December 1964 at Riverview Cemetery, Richmond, Virginia. Georgina Maria Hermann had 2 with 2 living in 1910 children. She and Louis L. London lived in 1958 at Richmond, Virginia. [S244] U.S. Federal Census 1910 U.S. Federal Census, by Ancestry.com, Year: 1910; Census Place: Richmond Clay Ward, Richmond (Independent City), Virginia; Roll: T624_1644; Page: 22A; Enumeration District: 0066; FHL microfilm: 1375657. [S243] U.S. Federal Census 1920 U.S. Federal Census, by Ancestry.com, Year: 1920; Census Place: Richmond Clay Ward, Richmond (Independent City), Virginia; Roll: T625_1909; Page: 3A; Enumeration District: 72; Image: 425. [S243] U.S. Federal Census 1920 U.S. Federal Census, by Ancestry.com, Year: 1930; Census Place: Richmond, Richmond (Independent City), Virginia; Roll: 2477; Page: 2A; Enumeration District: 0039; Image: 456.0; FHL microfilm: 2342211. [S373] U.S. Federal Census 1940 U.S. Federal Census, by Ancestry.com, Year: 1940; Census Place: Richmond, Richmond City, Virginia; Roll: T627_4320; Page: 3A; Enumeration District: 118-37. Name Variation Elisabeth Georgine Hermann was also known as Lizzie. Married Name 31 March 1902 As of 31 March 1902,her married name was Weimer. Elisabeth Georgine Hermann was born on 14 July 1876 at Wisconsin. Elisabeth Georgine Hermann was baptized on 3 December 1876 at Zion Lutheran Church, Chippewa Falls, Chippewa, Wisconsin. She married John Conrad Weimer on 31 March 1902 at Richmond, Virginia. Elisabeth Georgine Hermann died on 16 February 1967 at Richmond, Henrico, Virginia, at age 90. Married Name 9 March 1904 As of 9 March 1904,her married name was Wese. Bertha Hermann was born in November 1879 at Dakota Territory also reported as Nov 1881; also reported as Wisconsin. Bertha Hermann married Robert H. Wese, son of John Wese and Annie (? ), on 9 March 1904 at Richmond, Virginia. Bertha Hermann had 2 with 2 living in April 1910 children. [S245] U.S. Federal Census 1900 U.S. Federal Census, by Ancestry.com, Year: 1900; Census Place: Richmond, Clay Ward, Richmond City, Virginia; Roll T623_1737; Page: 7B; Enumeration District: 57. [S244] U.S. Federal Census 1910 U.S. Federal Census, by Ancestry.com, Year: 1910; Census Place: Richmond Lee Ward, Richmond (Independent City), Virginia; Roll: T624_1644; Page: 52A; Enumeration District: 0103; FHL microfilm: 1375657. Name Variation Ida Francis Isbell was also known as Isbel. Married Name 28 November 1906 As of 28 November 1906,her married name was Hermann. Ida Francis Isbell was born on 26 June 1884 at Virginia. She was the daughter of William Henry Isbell and Annie E. Bullock. Ida Francis Isbell married George Gottlob Hermann Jr., son of George Gottlob Hermann Sr. and Bertha Wilhelmine Friedrike Frohreich, on 28 November 1906 at Richmond, Henrico, Virginia. Ida Francis Isbell died on 9 February 1920 at age 35. She was buried after 9 February 1920 at Oakwood Cemetery, Richmond, Virginia. Ida Francis Isbell had 2 with 0 living in 1910 children. Children of Ida Francis Isbell and George Gottlob Hermann Jr.
Mary L. Hermann was born circa 1911 at Virginia. She was the daughter of George Gottlob Hermann Jr. and Ida Francis Isbell. Raymond H. Hermann was born circa 1913 at Virginia. He was the son of George Gottlob Hermann Jr. and Ida Francis Isbell. 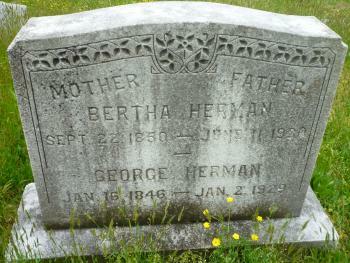 George Henry Hermann married Dorothy Isabelle Bowles, daughter of Preston Haywood Bowles Sr. and Ruth H. (?). George Henry Hermann was born on 1 September 1914 at Virginia. George Henry Hermann died on 8 September 2000 at age 86. He was buried after 8 September 2000 at Forest Lawn Cemetery and Mausoleum, Henrico, Henrico, Virginia. William F. Hermann was born circa 1919 at Virginia. Name Variation Goldie Pearl Martin was also known as Goldy. Married Name circa 1913 As of circa 1913,her married name was Schulz. Married Name circa 1913 As of circa 1913,her married name was Schultz. Married Name 12 September 1921 As of 12 September 1921,her married name was Hermann. Goldie Pearl Martin was born in January 1895 at Henrico, Virginia. She was the daughter of Charles H. Martin and Hannah Putze. Goldie Pearl Martin married (?) Schulz circa 1913. Goldie Pearl Martin married George Gottlob Hermann Jr., son of George Gottlob Hermann Sr. and Bertha Wilhelmine Friedrike Frohreich, on 12 September 1921 at Richmond, Henrico, Virginia. Goldie Pearl Martin died on 10 November 1952 at age 57. Children of Goldie Pearl Martin and George Gottlob Hermann Jr.
[S245] U.S. Federal Census 1900 U.S. Federal Census, by Ancestry.com, Year: 1900; Census Place: Fairfield, Henrico, Virginia; Roll T623_1713; Page: 30A; Enumeration District: 30. [S244] U.S. Federal Census 1910 U.S. Federal Census, by Ancestry.com, Year: 1910; Census Place: Fairfield, Henrico, Virginia; Roll T624_1631; Page: 13A; Enumeration District: 32; Image: 1072. [S243] U.S. Federal Census 1920 U.S. Federal Census, by Ancestry.com, Year: 1920;Census Place: Fairfield, Henrico, Virginia; Roll T625_1891; Page: 12A; Enumeration District: 43; Image: 1013.